1962 Maserati Tipo 151 Coupe. V-8 4-liter, 4 overhead cam, twin ignition, 5-speed box. 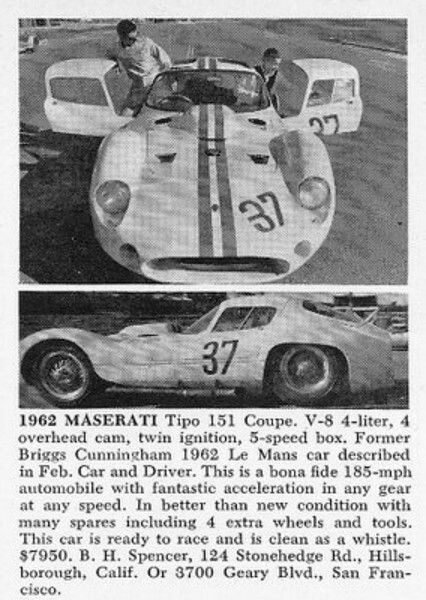 Former Briggs Cunningham 1962 Le Mans car described in Feb. Car and Driver. This is a bona fide 185-mph automobile with fantastic acceleration in any gear at any speed. In better than new condition with many spares including 4 extra wheels and tools. This car is ready to race and is clean as a whistle. Source: http://justacarguy.blogspot.com/2009/05/classifieds-in-old-magazines-turn-up.html.